Hop your way to glory in this large-scale, live-action tribute to one of video game’s most beloved classics. Celebrate one of the landmark arcade titles by actually becoming Frogger and conquering the challenging adventure. This analog variation of the popular video game casts you as a frog desperately trying to get home. A busy highway and swamp are the only obstacles between you and your goal, requiring swift timing and lightning quick decisions. Try your hopping ability at this one-of-a-kind experience that uses meticulous details from the original to accurately recreate the excitement of your very first Frogger attempt! 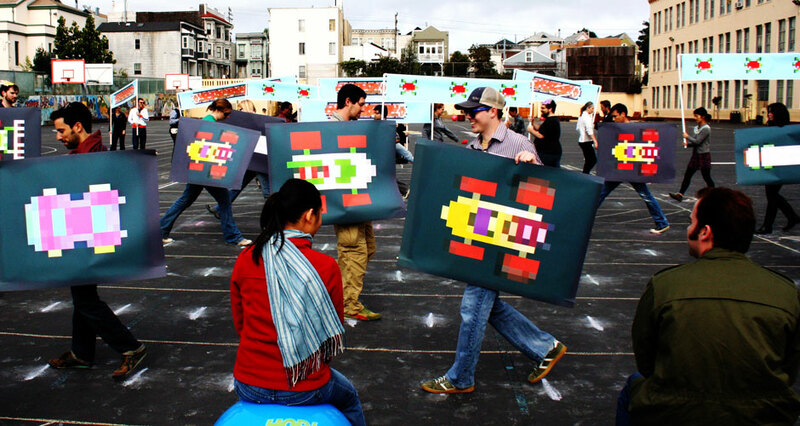 Field Frogger debuted at the 2011 Come Out and Play Festival in San Francisco and was a 2012 Official Selection at IndieCade. As a Senior Designer for ESI, Pete Vigeant draws upon his passion and expertise in game and youth-focused design to lead and develop interaction, media, concept, and game design for numerous ESI projects. Pete has played an integral role on a wide range of projects, including the award-winning Owen & Mzee and Miza websites, Panwapa World website for Sesame Workshop, and the PNC Fairfax Connection. Pete also leads the ESI Game Lab where he has created and launched a series of immersive live-action group experiences to promote collaboration through play, spectacle, and narrative gameplay. He has introduced ESI Game Lab experiences such as Field Frogger, The 100 Games Everyone Should Play, and Field TD in public spaces, city wide festivals, and conferences around the country. The Field Frogger team also includes Shaelyn Amaio, Michael Luck Schneider, and Matt Weisgerber from ESI Design.